Robot vacuums are designed to make cleaning easier, but long before you bring your new virtual maid home, finding the right robot to purchase can be challenging. You’ve likely heard of the popular iRobot brand of technologically advanced cleaners, but do you know what makes one of the manufacturer’s products better than another? We put the iRobot Roomba 880 and the iRobot Roomba 870 head to head to find out the secret behind those confusing product model numbers. Designed to take home cleaning to the highest level of convenience, the Roomba 880 and Roomba 870 are each popular robotic vacuum models from the iRobot brand. Both are equipped with the AeroForce Performance Cleaning System, which removes dirt, dust, hair and debris from all sorts of floor surfaces. But despite their similarities in purpose, appearance and name, these two models are actually quite different. Read on to find out how they differ. Hint: Price is only one factor. No matter which vacuum you’re considering, take a look at our list of best robot vacuums for tips on which features you should pay attention to before making a purchase. So what is it that accounts for the $100 difference between these two models? Let’s take a closer look at these smart floor-cleaning machines. NerdWallet takes you shopping: The more advanced (and more expensive) of these two vacuums is the Roomba 880, available for $699.99 from iRobot. This device — designed to provide a fivefold improvement in air power over preceding Roomba models — can clean your home without getting tangled in cords, falling down stairs or destroying furniture. The cleaner can even be pre-programmed to operate up to seven times per week. Set the device in motion and watch it make its way back to the home base when it’s time for a recharge. 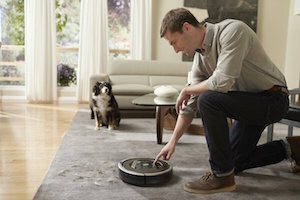 Convenience aside, perhaps the Roomba 880’s signature feature is its room-to-room cleaning capability. The device comes with two Virtual Wall Lighthouses (also available for purchase separately for $49.99 each). Users can utilize these lighthouses to keep their Roomba device limited to one room before maneuvering it to the next room when it is finished. Good fit for: The Roomba 880 is the right choice for homeowners looking for a top-of-the-line product that will provide the ultimate hands-off and hassle-free cleaning experience. 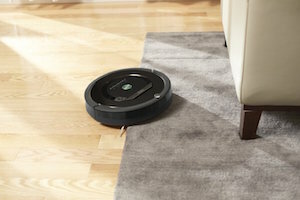 NerdWallet takes you shopping: Next up is the Roomba 880’s sister device, the Roomba 870. This robotic vacuum is sold by iRobot for $599.99 ($100 less than the preceding model). Much the same as the above-described vacuum, the Roomba 870 boasts anti-tangle technology, wall-edge vacuuming, a home base for docking and recharging, an extended life battery and an extra HEPA filter included with purchase. With so many similar features, the real distinction between these two models comes down to accessories. First, the Roomba 870 does not come with a remote control, while the 880 model does. Second, the 870 comes with two Virtual Walls, while the 880 includes two Virtual Wall Lighthouses. What’s the difference? Both virtual accessories use an infrared beam to stop your Roomba from venturing into areas that you have deemed off-limits. The more-advanced lighthouses, however, have an added benefit. They’re also able to direct the Roomba through room-to-room cleaning. The iRobot Virtual Wall Lighthouse is compatible only with select 500 Series models, the Roomba 780, the Roomba 790 and the Roomba 880. Good fit for: When choosing between the Roomba 880 and the Roomba 870, the 870 is an ideal match for robotic vacuum-owning hopefuls who don’t want to invest more than they need to, while still purchasing a sophisticated device. Images via iStock and Amazon.